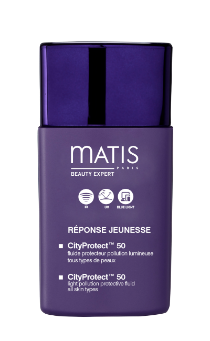 The first Matis global photoprotector which protects the skin against all light pollution (UV, Infrared, blue light) thanks to its global shield and thus prevents premature photo-aging of the skin. Apply to the perfectly cleansed face and neck in the morning over your normal treatment cream. Re-apply throughout the day as necessary, over your make-up. Helps preserve youthfulness by protecting skin from the factors responsible for premature skin photoageing. Provides a protective layer against light pollution.